Normally when we search about how to build a strong connection with someone we get advice like Ask about their families, hobbies, interests, be real, be authentic, be respectful, share your hardship, and things like that. These tips do work but I have a few more tips. Some of them may seem little offbeat but they actually work quite faster than other sophisticated tips. 1. Gossip – Best friends gossip about similar things. So if you want to befriend someone or to become closer to someone then you should first find out what other wants to talk about but is not talking it openly just because talking about it might make him perceive as someone who complains about everything or everyone. Everyone hates or dislikes someone. Nobody loves everyone. There will be some people whom that person hates for any number of reasons or likes to gossip about them just because they don’t like them. You just have to find out who those people are. It would be better if you can find out those reasons also why your friend hates them. This will help you to get even closer to them. Once you know who are those people your friend hates or dislikes try to talk to your friend about those people. Because your friend hates them he/she will start speaking out his/her frustration about them or what they did to him/her and then you just need to listen to him as if you agree with whatever he/she is saying. Do this trick whenever you think your friend’s mind is having some thought about these people without getting noticed by your friend that you are doing this for the purpose of getting closer to him. 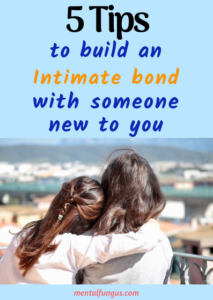 Sooner you will find that person is considering you as a close friend than before just because you get out his subdued anger and frustration against some people. Cooking is something that you do only for someone you really love and care. It is an Act of Pure Love for someone you really care about. When you love someone you really want them to eat what you’ve made especially for them. So if you want to get closer to someone make sure that you are offering them their favorite food that you’ve specially prepared for them. They’ll also feel nice about the fact that you have done this nice gesture for them and that you care about them. This phrase is absolutely correct that “The way to a man’s heart is through his stomach.” But this does not only applicable to men particularly but in fact to everyone. Eating Food with someone is also a unique way to get closer to someone. Whenever you sit with someone and have a meal together it creates a bond between you two. Everyone likes to have their meal shared with someone whom they like to chat while eating. Eating is considered to be a relaxing activity. We only eat when we feel relaxed. We are not supposed to eat in a dangerous or threatening situation. The whole scenario of eating is supposed to be friendly including whom we sit together and eat. Besides that, a person is more tend to open up in an environment like this. So if you want to get friendly with someone just starts eating together. The other person will definitely get closer to you. It is a quite obvious fact that people like to befriend those who have similar interest but it is also true in the case of enemies or rivals also. Yes, people are more inclined to be friends with those who have similar dislikes like them. Sharing similar aversions while chatting with friends make a friendship even stronger than talking about likes and interests. We can also say that gossip is more powerful than a commendable or agreeable talk in building a strong connection with someone. So if you want to make built a long-lasting bond with someone find out whom he/she feels envy with. What makes him/her jealous of this person? And then show them that you too envy the same person. This will make him/her feel that you are very much like them. Best friends are not those who respect and behave mannerly with each other but they do the exact opposite of it. Best friends never miss an opportunity to pull the leg of another. Giving each other stupid and embarrassing names and also calling it when it is going to embarrass them the most is the favorite thing of best friends. So if you want to be close to someone imitate this behavior. But be very careful while doing this because calling someone names or teasing someone, although in a casual way, might seem abusive and over the top especially when you are not that familiar to him/her. Let your friendship mature gradually and after some time start behaving like this. This is the major reason why this point is at the last of this list because behaving in this way needs more closeness than other points mentioned above.